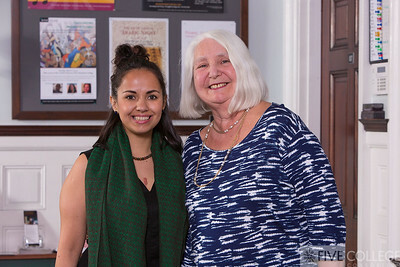 Peterson Prize winner Patricia Garcia of Mount Holyoke with retired Five College executive director Lorna Peterson. 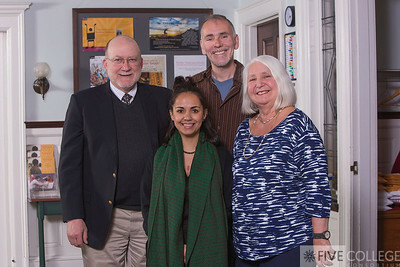 Five College Executive Director Neal Abraham, Mount Holyoke senior Patricia Garcia, Patricia’s nominating professor Christian Gundermann of Mount Holyoke and Lorna Peterson, retired Five College executive director. 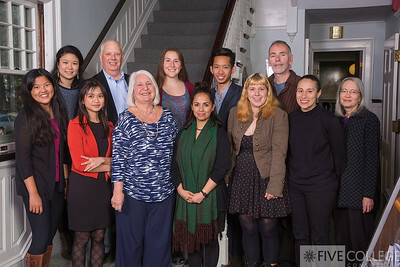 All the Peterson Prize nominees gathered at the Five College center in Amherst for dinner with Lorna Peterson and Five College Executive Director Neal Abraham.